Photography has existed in one form or another for almost 200 years now so you can imagine that in this time, a lot of photos have begun to look a lot like others. As more and more photos are being taken, it's becoming increasingly difficult to be original, and this is specifically very true when it comes to wedding photography. As weddings have had a set layout since 1837 (11 years less time than photography has existed) then you can appreciate that the possibility for new and original wedding photos is limited. It is for this reason that I like to do things differently where I can, and that's exactly what I did here, at David and Laura's wedding in Evesham. Traditionally you'd take this photo from lower down, with the bride and groom looking at you, slightly nervously as it's the first time they've been formally photographed together on their wedding day. 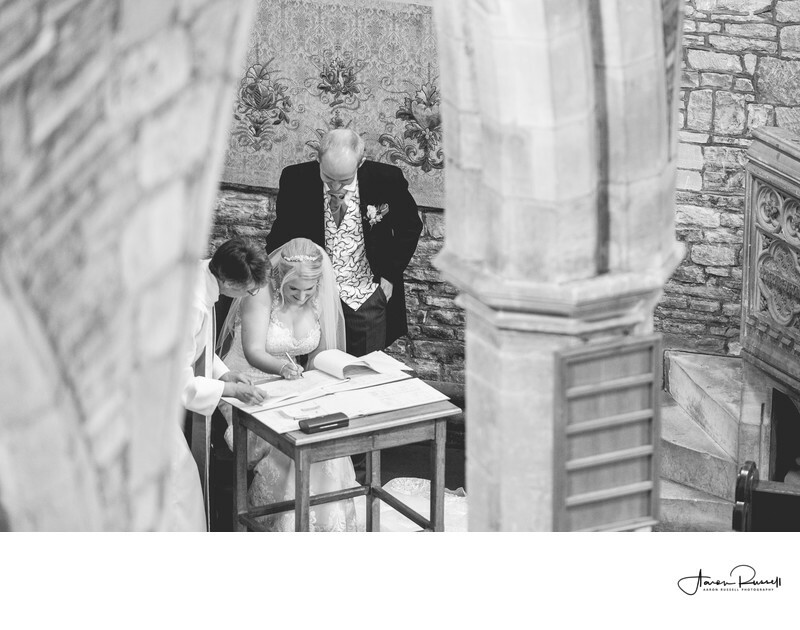 The signing of the register in church can take upwards of 10 minutes, so I knew I had plenty of time to nail something a little different whilst being able to return to ground level to take a more traditional photograph. The church had a large bell-tower, and a viewing gallery from where the bell-ringers rang their tunes. I was able to gain access to the viewing platform, and find an angle that enabled me to photograph the signing of the register in a new and most unusual way. It's a different photo, but a cracking one all the same.